Every Thursday evening, on a poorly lit street around the corner from the Paramount Theater, groups of computer hackers and tech whizzes slip through a battered glass door under an unmarked blue awning. An intercom and a hand-written note are the only sign that the door leads to anything more than an abandoned storefront. Inside, a freight elevator takes them up a floor to a loft space furnished with battered couches and boxes full of technological jetsam: circuitboards, resistors and miles of tangled gray cable. Books on coding lie on top of disassembled hard drives. In one corner, a giant satellite dish watches over the room. This is a hacker space. Sudo Room, as it is known, is a working space for technologists, activists and artists looking to collaborate on projects. Though on any given night the projects at Sudo Room can be as varied as the hackers themselves, one group, calling itself Sudo Mesh, is instead focused on one unified goal: building a free wireless network for Oakland residents. The group’s plan is to use low-cost wireless routers mounted on top of buildings to beam signals from house to house. The setup, known as a “wireless mesh network,” is basically a locally controlled communications infrastructure that can be used as a way to connect to the Internet, or as a neighborhood “intranet”—a closed local network that allows community members to communicate. The idea, from the perspective of Sudo Mesh, is to break away from centralized commercially owned Internet networks and provide free, community-based networks that are both more secure and more communal. Though the Bay Area has some of the highest rates of high-speed Internet access in the country, many of Oakland’s more impoverished neighborhoods are still comparatively disconnected. Bruce Buckelew, the founder of Oakland Technology Exchange West, an organization that distributes free or low-cost refurbished computers to low-income residents, conducted a survey through schools and community fairs in West Oakland and found that only 30 percent of residents had a working computer and Internet at home. Overall, the city of Oakland got a grade of “C” for broadband availability, according to a study by the East Bay Broadband Consortium. Bridging this “digital divide” in Oakland is exactly what Sudo Mesh hopes to do with the wireless mesh network. Proponents of mesh networks tend to emphasize the fact that the networks are community-owned and operated, which means they are not subject to the control and high prices of Internet Service Providers. In Spain, the Guifi network has over 30,000 nodes, offering free wireless connection across rural Catalonia and Valencia. The Funkfeuer network in Vienna, the Freifunk network in Berlin, and the Athens network in Greece are the largest true mesh wireless networks in the world. In the United States, mesh networks exist in New York, Detroit, Milwaukee, St. Louis, Champaign-Urbana, and San Francisco. They have been used in rural Afghanistan and Kenya to access the Internet, and have been used as community controlled telephone systems in Africa and South America. In Nepal, mesh networks have been used to provide medical consultations with remote villagers. Because mesh networks are decentralized, they are also less vulnerable to disruption, because removing one node won’t cripple the entire network. According to the Electronic Frontier Foundation, a digital rights and privacy watchdog, this makes wireless mesh networks valuable tools for ensuring “the free flow of information without exposure to censorship and monitoring.” They can also provide connectivity in difficult-to-reach areas. Many see the real value of mesh networks as providing communications systems in the event of emergencies when cell phones and traditional Internet networks are down. 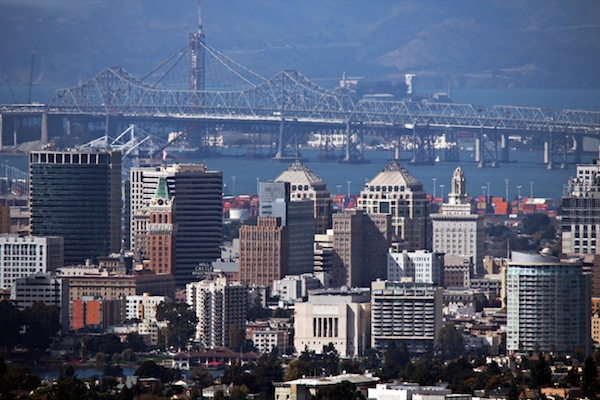 Marc Juul, one of the leaders of Sudo Mesh, says that the group is currently working to develop an infrastructure that could withstand an earthquake, the most likely disaster in Oakland. They also imagine local businesses using the network to advertise directly to neighbors, as well as utilizing Oakland Wiki, a crowd-sourced site for information about Oakland, and location-based services like maps displaying local points of interest. But getting Oakland residents on board may not be easy. People in low-income communities “don’t necessarily see the value” of Internet access, said Buckelew. And they face “scores of issues like housing, bad credit history with Comcast or AT&T” to go along with lagging access to high-speed Internet. So far, the group has purchased over 120 routers, or “nodes”, using $3,000 raised through a crowd-funding campaign over the summer. The next step is to build the network by convincing dozens of residents to mount a router on the roof of each person’s home. “We’re hoping that as many people as possible will adopt one of these nodes,” said Juul. To get the system up and running, Sudo Mesh is taking advantage of the growing number of Oakland residents who arrive with high-level technical skills. At one recent meeting, new members included a guy who designs radio communications for satellites, and a computer hardware expert with intimate knowledge of the technology. While the project is still in the early stages, the group has been busy building the technological infrastructure, and is now entering the phase of testing the individual nodes and setting up a small test network on rooftops. Once in place, the routers will be able to provide free wireless Internet access to residents by first connecting to local Internet connections shared by individual nodes in Oakland and then potentially with other larger connections like a public Wi-Fi tower located in Richmond. That would provide the backbone of the network, which could then continue to expand as new routers are added. Correction: An earlier version stated in the caption that the nodes were “current” rather than “potential”. The article also stated that the group is testing the individual rooftop routers when in fact they are testing nodes and a small test network. Also, it has yet to be determined if the Internet will be provided from a public wifi tower in Richmond. Neat idea. The internet access has to come from some paid for source though. Any idea what that source would be and how it would be paid for? I have just moved to Oakland in the last month from sant monica. I have been a tech writer in electrionics and job shopper for 30 years on the east coast before moving to ca. I am presently rooming in Oakland, I am also a ham operater, as noted by my ID. I would be interested in this project. Maybe I could interest my landlord in installing a routed on his house. I live a 2021 myrtle st in west Oakland. We are deploying a test-network in west oakland over the next couple of weeks. It sounds like it will come from multiple sources. Individual nodes can share their own Internet connection with the network and then the group will look for partners with larger connections to join the network. The Internet Archive in Richmond with the public wifi tower, for example, pays for the Internet connection but offers anyone the ability to connect for free.